In an interview with Sputnik, economist and geopolitical analyst Peter Koenig said the EU, as an organization, never intended to enhance the prosperity of ordinary Europeans. The interview came after the release of a European Central Bank (ECB) survey which indicated that the gap between the rich and the poor is on the rise in Europe. Ten percent of eurozone households own more than half the region's wealth, with half a million euros each on average. Meanwhile, the poorest five percent owe more than they possess, and are stuck with negative net worth, according to the survey. 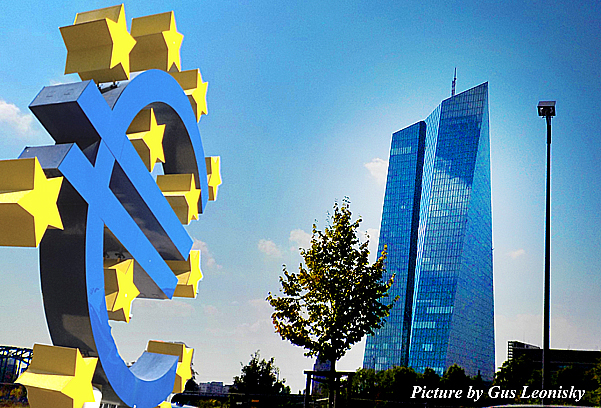 The picture above is that of the new European Central Bank headquarters in Frankfurt, Germany. 185 m high office tower +++ 250 m long Grossmarkthalle +++ 120,000 m² total site area +++ 700 trees planted on site +++ 6,000 panels in the office tower facade +++ 14 steel trusses in the atrium +++ 73 km of repointed facade joints. COST: Three-and-a-half years later, in the fall of 2013, there is a different reality in Frankfurt's Ostend district. Instead of the estimated cost of €850 million ($1.15 billion), the entire project will now cost at least €1.15 billion and could even eventually climb to €1.3 billion. Originally, the costs for the structure were not to exceed €500 million. The locals say the new building really cost more than 2.5 billion Euros... Note the added Euro symbol in the picture is from one of the main plazas in Frankfurt (pictures from Gus' Library). Koenig described the EU as not a union in the full sense of the word. "It has no common constitution, no common political goals and it is too diverse culturally and economically to be united under one currency, the euro, which has been a failure from the beginning," he said. Koenig also pointed the finger at the EU for doing little to improve people's living standards. "From the very beginning, the purpose of the European Union and the common currency was not to create a prosperous Europe. It was an idea of the United States to have a Europe which could be subdued, something that is currently happening," he pointed out. Koenig said rising unemployment levels were "an important factor" driving rising poverty levels among ordinary Europeans. "Unemployment is a [result of the] neoliberal trend of privatizing everything, which puts people out of work and which makes pension funds privatized.Also, [privatization] puts the private sector in charge of social services, which is why benefits for people become much lower," Koenig said. When asked why European bankers would betray the interests of their own particular countries and countrymen, he said that "we have lost all sense of solidarity within the Western world." "The European bankers are only interested in an instant profit rather than the wellbeing of ordinary people, just like the US banks," he pointed out. Despite working around the clock wreaking havoc on American democracy, the Russian hacker still found time to rattle Europe, where sold-out leaders are attempting to suppress a slew of homemade crises, including the arrival of millions of undocumented migrants from the Middle East (complete with handsome benefit packages provided by EU taxpayers), painful austerity measures amid a devastating economic downturn, and the continuation of a Russian sanctions regime that is hurting European producers far more than Russian consumers. Naturally and predictably, such devastating policies strike like an earthquake at the heart of communities, leading to the spectacular rise of far-right political parties, like the National Front in France, Britain’s UKIP and the AfD in Germany. This is by no means political rocket science. So who to blame for this massive grassroots political movement across Europe? Yes, the usual suspects: the Russians and their amazing computer skills. In fact, some would actually have us believe that Brexit was a Russian hack job. Labour MP Ben Bradshaw appeared to be auditioning for a stand-up comedy job when he told his peers it is "highly probable" that Russia interfered in the UK’s Brexit referendum. "I don’t think we have even begun to wake up to what Russia is doing when it comes to cyber warfare,” Bradshaw said without a hint of irony. "Not only their interference, now proven, in the American presidential campaign, [but] probably in our referendum last year. We don’t have the evidence for that yet. But I think it’s highly probable." Take a moment to reflect upon that last line, because it’s the same line being used as 'proof' of Russian infiltration across the pond in America: “We don’t have the evidence for that yet. But I think it’s highly probable." The main character of what is presented here is the lack of confidence in the EU leadeship which has been played like a hard-working naive girl who has been raped by her elder brother the USA. The naivety is also further added to by the lack of honesty in the European leadership. Too much arse protecting in the politician species. Sure there are some success in economic developement but having followed orders from the Potomac Uber-Sewer has thwarted the real potential FOR THE EU PEOPLE. As I have said before, the USA does not want a strong and competitive Europe. It wants a vassal. The new Trump silliness at the White House should be a wake up call. On the other side of the ledger, Europe has Russia which has been patient, despite being villified every hour for no real reason, but for a dream of the USA to bring Russia in line with its Empire. This is sending a few mixed conflict in regard to Ukraine (thuggish government), Crimea and other countries which are not getting any benefits from the EU. Some countries are getting hammered: look at Greece for example. SOME BETTER COMPROMISES ARE NEEDED. Democracy needs to be more honest and related to the people in diversity. It's not easy, as Europe has turned itself into a control freak and a bureaucratic nightmare for too many. In the long run, all this can be fixed, mostly by BYPASSING Brussels's edicts (which has been controlled by the USA) and by setting up a greater relationship (friendship) between the EU states. Of course a BETTER relationship with Russia would help as well on the economic front. NATO NEEDS TO BE DISBANDED for a more European system of defence that is INDEPENDENT of Washington. Here you need some clever thinking — possibly a 180 degrees turn around and a better general mood. Difficult at the moment with all the EU right-wing populism and the EU left-wing anti-Russian stance — but not impossible. Time to wake up... and stop missing the opportunity to become the first world power as you should and could. Twenty-five years after its inception in 1992, the European Union is facing a plethora of economic, defense and security problems. The integration processes going on ever since have laid bare deep-seated political differences between members of the 28-nation bloc. The idea of a single Europe was originally meant to put the war-scarred European economies back on track through desperately needed investments, economic integration and industrial cooperation. In 1957 France, West Germany, Italy, Belgium, Luxembourg and the Netherlands established the European Economic Community (EEC) lifting customs barriers and integrating their economies. The EEC eventually expanded to include Britain, Denmark, Greece, Spain, Portugal, Austria, Finland and Sweden. Many experts explain this “integrationist fever” by Brussel’s desire to create a European super-state. Such ambitions by the advanced European countries, above all Germany, eventually backfired though. Hit hard by the 2008—2009 financial crisis in the US, the debt-strapped Western European countries were faced with a financial meltdown in Greece. According to the 1992 Maastricht Treaty undertaken to integrate Europe, the gross government debt of an EU member country must not exceed 60%, but even the EU powerhouses, Germany and France, fail to meet this criterion (70% and 100% respectively) while Greek debt amounts to a whopping 170% of GDP. The EU's Schengen visa-free travel zone is now in trouble amid an unprecedented migrant crisis and the growing threat of terrorism. what does the Deutsche Bundesbank know? The Deutsche Bundesbank is collecting all the German gold from its overseas and European hideouts. By 2020, 100 per cent of the Deutsche Bundesbank will be in Frankfurt... Last year alone, it transported 216 tonnes of the stuff. What does the Deutsche Bundesbank know that we don't? Here I was pissed out of my mind to aleviate a few pains due to ageing and suddenly I had a revelation. The Europeans should ditch English as the "common" language. The European Community should now adopt German and French as their official inter-communication diplomatic language. Every diplomat should learn both lingos. This would make life interesting. As well some of these diplomats should learn Russian and Mandarin. A background picture of the American flag that went up alongside the European Union flag as Pence and EU leader Donald Tusk spoke on Monday had 51 stars instead of the usual 50, one for each state. BRUSSELS — The Star-Spangled Banner looked more starry than usual during one of U.S. Vice President Mike Pence’s appearances in Brussels. The Brussels version of the flag had three rows of nine stars and three rows with eight stars each. American flags typically feature a total of nine alternating rows of five or six stars. The EU flag featuring 12 stars in a circle against a blue background was configured correctly. And the American flag had the right number of stripes — 13. The EU Council did not immediately respond when asked about the error with the misplaced star-state. Next week, the leaders of EU nations will assemble in Brussels for a European Council summit, and one of the meeting points will be to come up with a joint conclusion on Brexit, according to media reports. The leaders of 27 EU nations are expected to issue a joint statement blaming UK Prime Minister Theresa May for a “lack of progress” on UK-EU Brexit negotiations, despite the looming deadline. However, according to the draft of the document, the leaders plan to express their "concern that no substantial progress has yet been achieved on agreeing to a backstop solution for Ireland/Northern Ireland." The motion also urges "member-states and all stakeholders to step up their work on preparedness at all levels for all outcomes," the Independent cited the leaked document. What is meant by the last sentence is the probability of Britain not coming up with a UK-EU deal in time, usually referred to as a "no deal" scenario. If this were to happen, EU countries must have contingency plans at hand, and work on them must be accelerated as soon as possible, according to the paper. EU leaders want "further clarity from the UK with regard to its position on the future relationship," the document reads. While the document is written in an appropriately diplomatic manner, this is actually an escalation of language to the point of a direct warning to the UK's PM Theresa May, the newspaper notes. At 4pm on the 10th of November 2018, 100 years after the end of WWI, which laid waste European civilization for decades, we are not only recalling history; we are taking our future into our own hands. It is time to turn the promise inherent in Europe into a reality and to remind ourselves of the founding ideas behind the project of European integration. We declare that everyone present at this moment in Europe is a citizen of the European Republic. We acknowledge and accept our responsibility for the common heritage of the Universal Declaration of Human Rights, and we pledge finally to make it into a reality. We recognize that Europe’s wealth is based on the exploitation of other continents and the suppression of other cultures over centuries. For that reason, we are happy to share our territory with those whom we have driven from theirs. Anyone who wishes to can be a European. The European Republic is the first step on the path to a global democracy. The Europe of nation states has failed. The dream of European integration has been betrayed. Without political underpinning, the Single Market and the euro fell easy prey to a neoliberal agenda which runs counter to the goal of social justice. The powers of the European institutions must therefore be appropriated so that a common market and a common currency can be created within a common European democracy. Because Europe means unifying people, not integrating states. The sovereignty of states is hereby replaced by the sovereignty of citizens. The European Republic is founded upon the principle of universal political equality irrespective of nationality and social or ethnic background. The constituent elements of the European Republic are the European cities and regions. The time has come for Europe’s cultural diversity to express itself within a framework of political unity. The European Council is hereby decommissioned. The European Parliament now has the power to make law. It will appoint a government committed equally to the welfare of all European citizens. On 10 November, at 4 PM, from theatres, balconies and public spaces all over Europe, artists and citizens will proclaim a European Republic, discuss, and pave the way for the emancipatory claim of citizens’ equality beyond the nation-state. The European Balcony Project was initiated by the European Democracy Lab and realized with the support of numerous citizens across Europe.